The Convergence march was as broad politically as it was long. In the march were U.N. Secretary General Ban Ki-moon, former Vice-President Al Gore, and New York Mayor Bill de Blasio, New York State legislators and several New York City council members, their presence signifying that climate change had gone main stream. 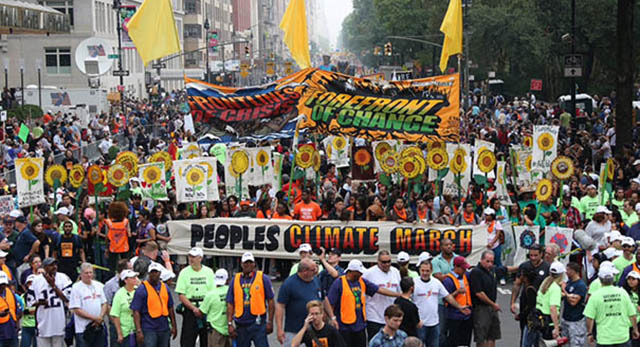 The People’s Climate March, September 21, 2014, in New York City. At the same time, bringing up the rear were those of us in the anti-capitalist contingent of a few thousand socialists, anarchists, and others who know capitalism is the cause of the problem and believe in a democratic socialist society, even if we don’t know or agree about what to put in its place. And who can blame us, for it’s not clear how we get from here to the new democratic, egalitarian, socially just and environmentally sound society that we know we need. Most folks were marching in the middle somewhere, not trusting the corporations, dubious about government, wanting to get rid of fossil fuels but without a clear political vision of where we’re going. That is perhaps the biggest thing missing from the movement right now, a unifying strategy for the majority if not a strategy for all. Dan La Botz is an editor of New Politics, where this article was first published, and a member of Solidarity in New York City.